A flash back in time and just a short 10 years ago, the phrase ‘social influencers’ was inconceivable. Today, social influencers are reaching a community status that reins in the power of celebrities and journalism and positions them as a powerful entity for brands and messaging in their own right. While in relatively infant stages for some sectors, others are embracing this voice opportunity. With this shifting force in advertising and public relations, are celebrity ambassadors a pertinent strategy or are brands best to invest in bloggers and online social influencers? Celebrity endorsement strategies have been in place for decades. These relationships worked influentially back where consumers were less sceptical and the era of marketing was seen as an authentic company voice. Companies were able to capture the personality’s established following and connect that audience to their brand. They were able to generate instant brand appeal from the likability of the celebrity, and when the association appeared credible, brands cashed in on this business exchange. However, as more and more companies pressed brands in the faces of consumers, the believability and fascination diluted. While the cost has become significant depending on the selected personality. Then came the fast paced digital world, re-igniting creative possibilities through voice, imagery, video and wording, and making these associations appear even more personal. No longer hidden behind TV screens and magazines pages, having a celebrity use products in everyday settings and hold ‘real-time’ dialogue with their following about your brand is marketing in its finest form. Brands can execute integrated campaigns across traditional and digital media – reinforcing the messaging across multiple platforms. Investing in celebrities doesn’t come cheap, and the risks of brands being swept in the misdemeanours of celebrities are amplified, as consumers can voice their views, and are technically skilled in creating viral content like memes. With online content having an enduring lifespan and no longer ‘fish and chips’ wrapping, there is permanency and a lack of control in brand voice being at the hands of the public. Consumers are becoming more conditioned to recognising paid endorsements and a celebrity that blazes their name across multiple partnerships is suddenly more obvious in an Instagram gallery. While their activity levels can also effect delivery of brand messages. The lack of brand control extends to forced associations – where there is the risk of a celebrity being snapped using a rival brand. The recent divorce of Brangelina saw a wave of social activity across the world. 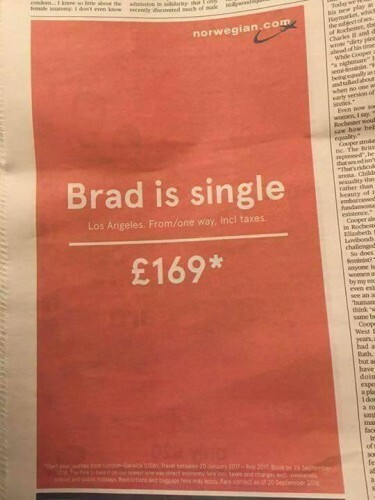 One company, Norwegian Airlines, jumped on the explosiveness of this news, and quickly executed an advertising campaign promoting an offer to Los Angeles. I assume Brad Pitt wasn’t engaged as a face for Norwegian Airlines – who would be up for millions. Instead, the brand was able to draw out the benefits of this celebrity news to their commercial benefit at no cost. This appears to have the same effect, if not an even stronger effect of a celebrity brand campaign. It generated viral content across the world, media publicity and a new-found humanised affection for the airline. I have no doubt sales were made. Not a bad result for a campaign without celebrity fees attached. Brands are also capturing celebrities consuming their products, again these are unpaid social opportunities that haven’t required exhausting contracts and arrangements – and deliver a true presentation of a preference for a brand. Meanwhile, the rise in every day bloggers and social influencers has added a new dimension for brands. Generally affordable, flexible and relatable to the population, these marketing assets are making waves in brand campaigns. Without the complexity and within easy reach, social influencers are viewed as credible sources with a recent study indicating that over 80 per cent of consumers are highly likely to follow a product recommendation made by an influencer. While a single paid celebrity partnership can dent a marketing budget restricting the extensiveness of a campaign, multiple highly relevant influencers can be reached economically and achieve brand coverage in a measurable creative strategy. These influencers can be utilised for reviews, integrating product use, blog and social posts as well as pure advertising. For sectors like food, fashion, lifestyle, retail and health, it’s an approach that can support traditional brand campaigns or hold its own depending on the business intention and capacity. It’s a vehicle that can be quickly executed to react to timely events. It’s a vehicle that should be considered in the marketing mix, and it’s a fledgling opportunity yet to reach maturity. Mimi Elashiry (above) is a self-made female model from the eastern suburbs of Sydney. The combination of being genetically blessed and showcasing the life of a perfect beach – lifestyle Mimi gained ‘Insta-fame’ within a short period of time. Dubbed “that babe on Instagram” her international following grew and grew. After rejections from multiple talent and modelling agencies Mimi got the last laugh. The pint-sized digital influencer is flown all over the world on trips, is backstage at festivals and concerts across the world and has had endorsements with national and international companies. She is paid to influence her following into ‘liking’ and ‘double tapping’ brands, events and products ranging from clothing through to non-permanent golden tattoos. The movement is unprecedented with everyday people reaching international profiles, media attention and even celebrity attention. The social influencer movement offers start-ups through to multinationals a convincing brand platform. The future is ripe and it’s a pocket that hasn’t yet been utilised to its fullest extent. In a brands quest to deliver campaigns that maximise allocated budgets and create a more personal connection with consumers, taking the time to invest in social influencer strategies will realise the diminishing return of traditional celebrity partnerships. With the rise of the influencers comes the rise of the management agencies. #AsSeenOn is one influencer management company on the market launching earlier this year to fill a market for up-and-coming affordable bloggers with an engaged following. Maintaining personal relationships with these influencers and relevant brands from start-ups to multinationals across varying sectors.